Ballet is the foundation of all dance techniques. This is a comprehensive beginners ballet lesson that introduces ballet technique, line and performance values that can captivate children and open the whole world of dance to them. 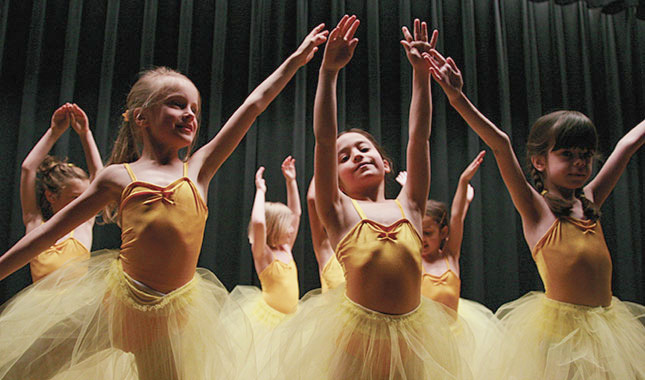 Students are gradually introduced to the basic elements of the ballet barre: turn-out, the vertical stretch, demi-plié, relevé, tendu, dégagé, fondu, rond de jambe, développé, battement. They are introduced to basic ballet body positions: en face, croisé, effacé, écarté and in every class practice a port de bras sequence taking them through the first, second, third and fifth positions of the arms and feet. Children also begin learning basic ballet steps: balancé, chassé, sauté, glissade, pas de bourrée, temps lié, échappé, changement. The teacher introduces the technique of spotting and once they can do it, then children have the fun of learning simple turns like chaîné, piqué and soutenu. and how to propel themselves in space on the floor in large center combinations. Our ballet lessons for children are designed to give them insight into the art of dance and to develop and nurture their love for it. We are so proud that so many of Discovery Programs ballet students have been chosen to attend the School of American Ballet. Please note: All dance students ages 3-12, participate in our annual Nutcracker recital and have the thrill of performing on stage for their families and friends. View the required dance attire and guidelines for the performance. ** Please note: all dance students ages 3–12, participate in our annual spring recital and have the thrill of performing on stage for their families and friends. Fees do not include tickets.